My favourite time of year - Fashion week, or should i say Fashion month? For the regular fashionista's out there, no fancy invitations or parties just a constant addiction to social media to feel part of this amazing world. My Instagram and Twitter are refreshed so often i am surprised they havent broken, with all the updates from various pillars of the fashion world showing the shows, the models and the must have items from each designer. One of my favourite fountains of fashion info during the shows is Vogue.co.uk with details from all the catwalk shows almost immediately, i am able to see the amazing creations and collections even if i am sat in my living room. This season i was inspired to find not only my old time favourites but also some new designers, that i had previously not been that aware of. 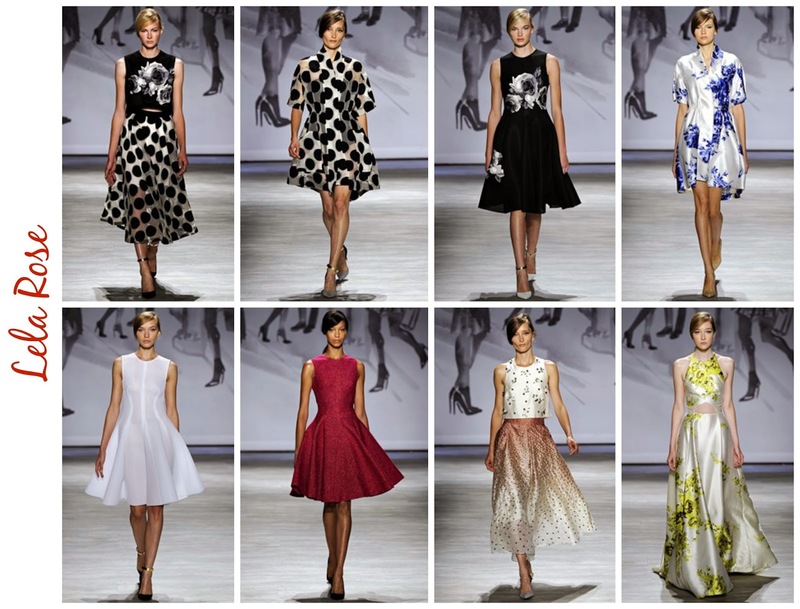 Here are the SS15 collections i loved - amazing and beautiful in their own right. I became aware of Alice & Olivia a couple of seasons ago, after seeing a stunning tulle dress evening gown on the red carpet (remember the dress, but not who was wearing it!). The SS15 collection was awash with strong prints, colour both bold and pastel and a mixture of simple and more extreme silhouettes. The variety in the show was beautiful and meant an Olivia & Alice girl would look fabulous during the working and day and at any party or event. My favourite look was that of the 1950's esque cocktail dress in simple black and white, my only addition would have been some colour in the shoes - this dress would look fabulous with a pair of killer heels from Sophia Webster. 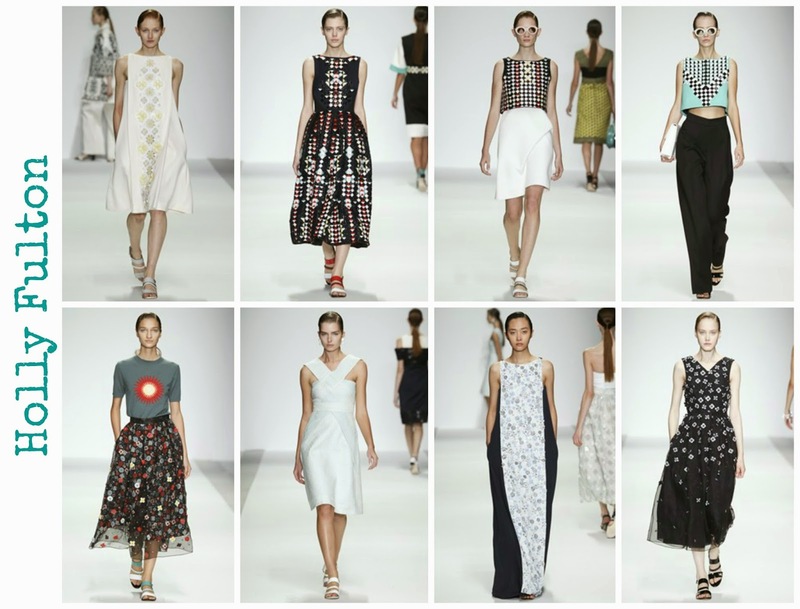 A collection built around classic silhouettes and brought to life through the use of print and pattern. The mosiac tile effect within the print, gives a slight futuristic element whilst still being very feminine. A simplistic palette of black and white with precise hints of colour, like the subtle addition of the mint green crop top to a modern day work look. I love the black and coloured dot, tulle midi skirt a nice use of materials to add print rather than a patterned fabric, although not quite so sold on the bullseye top that completes the look. I do wish this had a little more colour to it but I guess this would have ruined the simple lines within the collection. 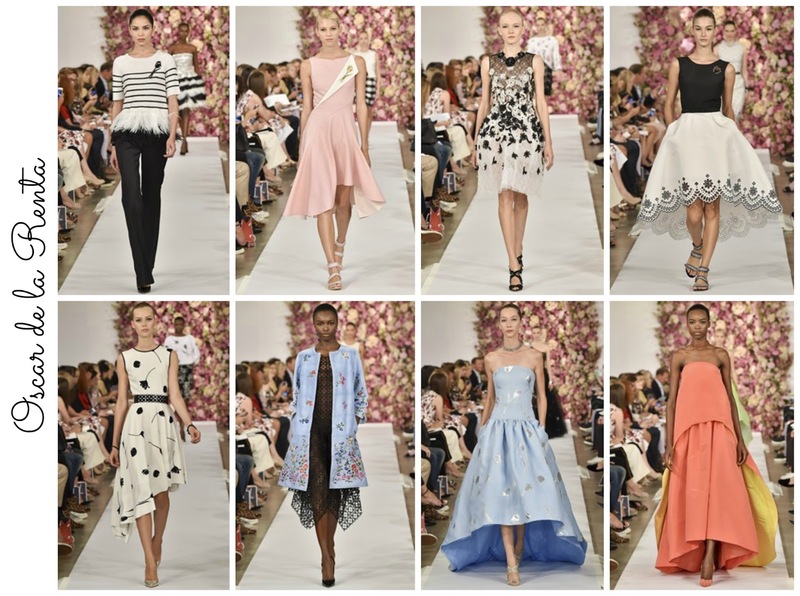 A new designer on my radar this season, Lela Rose and i think my favourite. Elegant, simple silhouettes but with a bold use of print and pops of strong colours - shades of lime, oxblood and cobalt blue. Plus the use of a lot of fluid fabrics such as silk, which add to the femininity of the collection. My favourite prints are the lead in oversized polka dot and the vintage florals in particular I am drawn to those used on the lime silk number #8 above - a very glamorous look. Majority of outfits in the collection were either midi, skater or maxi skirt/dress styles with only a couple of outfits based around trouser/culottes styles. An old favourite, who for another season has managed to produce a beautiful collection. Particularly loving the ballgown element of the collection, the baby blue embellished style is elegant but with a modern twist, whereas the orange and yellow style is an unexpected pop at the end of the show. The only element of this that i was not so excited about was the opening portion which heavily featured coloured gingham - not something that felt cohesive with the rest of the collection, Oscar is best known for glamour and that is where i felt the strength in this collection. Wanting to show that the brand can do more than just girly, this new collection shows attitude, plus a lot of flamingo's. With the usual variety of print and colour, the latest collection is just as beautiful as the SS14, that made me fall in love. 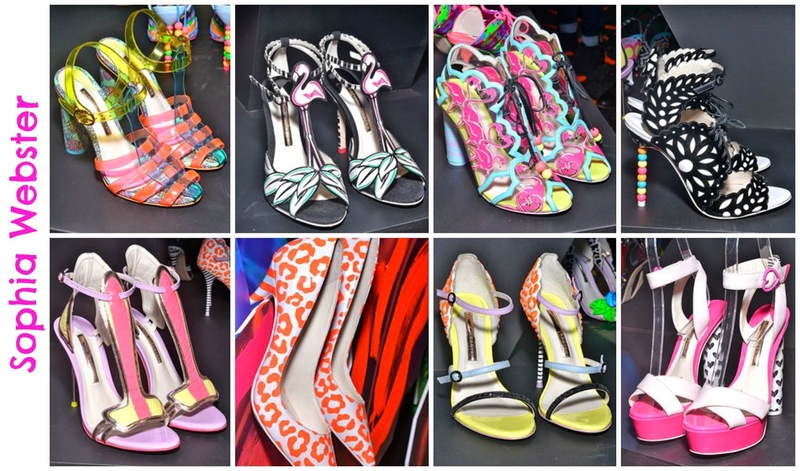 All of the styles are pieces of art, down to intricate heels and laser cut details but i think my favourites would have to be #5 - a modern day t bar in pastels, plus #8 - barbie platforms with heart covered heels. Gorgeous is my final word on these collections! Do you have any Fashion week favourites? Have you seen these? 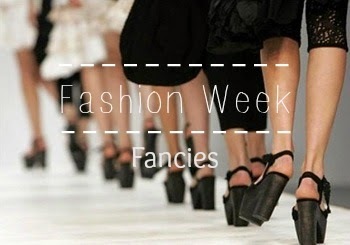 A series of short films on LFW by the BBC. An interesting watch!